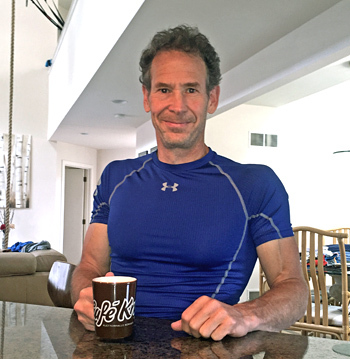 At home, enjoying a pre-workout Café! If you are a coffee aficionado like me, then this article is for you! Your addiction—er, culinary ritual—may actually give you an extra edge both in training and climbing. Caffeine (the active ingredient in coffee) is the number one ergogenic aid of the common man and athletes alike. It’s caffeine’s well-documented effects on the central nervous system that help you wake up in the morning, gather your focus at school or work, and become a bit more productive at the gym. Remarkably, caffeine has also been shown to have numerous positive impacts on health—most notable are its protective effect when it comes to neurodegenerative diseases (Parkinson’s and Alzheimer’s) and cancer (bladder, pancreatic, breast, ovarian, colon and colorectal). If you consume a daily coffee, espresso, tea, or another caffeine-laced drink like Red Bull or Mountain Dew, then you know first-hand the stimulant effects of caffeine. But there are several other ways that caffeine might help you train and climb harder, as well as a few undesirable side effects that you need to be aware of. Let’s sort things out. Here are the most notable performance-enhancing effects of caffeine, as summarized in an excellent meta-analysis research paper by Bülent Sökmem, et la (2008). Improve concentration, alertness, and mood, especially in sleep-deprived athletes. Enhanced reaction time and improve accuracy in skilled movements. Lowered peripheral pain perception and rating of perceived exertion. Increased work output and time to exhaustion during predominantly aerobic-powered endurance exercise (e.g. endurance routes and multi-pitch climbs). Increased power output and isokinetic strength in maximum strength and power events lasting less than 10 seconds (e.g. a short, maximal boulder problem, campus training, one-arm pull-up). Considering these cognitive and physiological effects, it’s not surprising that so many climbers consume caffeine, not only in the morning, but also upon arriving at the gym or crag. Still, you must be careful not to develop a more-is-better mindset when it comes to quaffing your favorite caffeinated drink—there are some potential negative impacts to consider. High doses can make you jittery and nervous—not ideal for a delicate face climb (requiring fine motor control) or before competition. High doses may impart a generalized ill-feeling due to gastrointestinal distress, headache, and perhaps even heart palpitations. Given caffeine’s half-life of 4 to 6 hours, consumption in the afternoon or evening may lead to insomnia or a restless night’s sleep (thus, negatively impacting your recovery and next-day performance). High doses of caffeine have been shown to lower blood pH (more acidic) and therefore it may negatively impact high-intensity exercise performance relying on the glycolytic energy system (e.g. a long boulder problem or short, pumpy sport route). So how much caffeine should you consume to gain a performance edge? Ultimately that depends on your tolerance to this drug, which is a function of the amount you habitually consume each day. Across the research literature, subjects consumed between 3 and 13mg of caffeine per kilogram of body weight, however low to moderate dosing of 3 to 9 mg per kg seems optimal (most upsides with least negative side-effects). 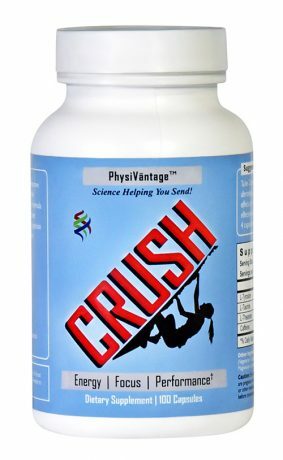 For the average-sized climber, this equates to consuming somewhere between 200mg and 600mg of caffeine—use the low end of this range if you are caffeine “naïve” and upper-range dosing if you are a regular, heavy consumer. See the Table below for approximate caffeine content in common beverages. The bottom line: caffeine use can potentially enhance your training and climbing performance, but caffeine “over dose” will likely hurt your performance. The key is to experiment with and understand caffeine’s unique effects on you. Ideally, you’ll learn to manipulate your caffeine dosage to get the best performance-enhancing effect via moderate dosing—that is, decrease daily dosing in the days leading up to critical climb or competition, then return to your “normal” moderate dose on the day of the event. This is a superior approach to simply doubling your caffeine dose on the performance day, thus risking the negative side effects listed above. Copyright © 2000–2019 Eric J. Hörst | All Rights Reserved.